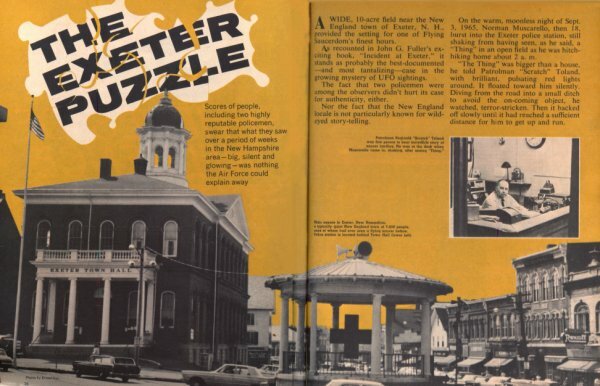 An article on the Exeter sightings in True magazine (1967). On this day in 1965, witnesses around the town of Exeter, New Hampshire (USA) reported seeing a large, silent, and glowing object in the late-night skies overhead. To be sure, reports like these occurred with some regularity at the time. But what made this flap different was the fact that two local police officers also claimed to have witnessed the strange object. And reports of sightings for several weeks later only added to the mystery. The story of that night was covered several months later in an article in Look magazine and some time later in the magazine True. But it was the 1966 book by John G. Fuller (Incident at Exeter) that helped turn the event into a canonical part of UFO lore. In 2011, UFO skeptics James McGaha and Joe Nickell put forward what they consider to be a definitive explanation for the original sightings: a U.S. Air Force KC-97 plane in the act of refueling another aircraft. 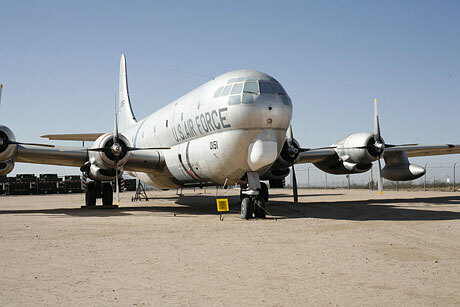 A U.S. Air Force KC-97. From: James McGaha and Joe Nickell, “‘Exeter Incident’ Solved! A Classic UFO Case, Forty-Five Years ‘Cold,”’ Skeptical Inquirer, 35 (November/December 2011). For some additional photos and follow-up materials regarding the case, follow this link to UFO Evidence.